There are lots of reasons to sign up for the Beautiful Joe’s beautiful subscription service. To begin with, it will make your dog indescribably happy. Our treats are so delicious that we have never met a dog yet who could resist them. And there’s the convenience of a regular, monthly delivery, ensuring that a certain someone with four legs and a tail never has to go without. You’ll be making some abandoned and stray dogs happy, too. For every packet we sell, we donate the same quantity to a rescue home. Finally, you can feel satisfied that you are being fiscally prudent. Because for every four packets of treats you buy, we will give you two packets, absolutely free. Every time you buy a packet of our treats, we donate the same quantity to one of over 70 rescue homes nominated by our customers. Most rescue homes can’t afford to buy any treats for the dogs they look after, let alone air-dried, pure liver treats. The free treats we give away are mostly used to train rescue dogs so that it is easier for them to find new, forever homes. If there’s a rescue home you’d like us to support please include details with your order. Because of postage costs we will wait until we can send the equivalent to 100 packets so unless you are placing a huge order it may take a little time until we get to your nomination. We generally only support registered charities but we will make exceptions. You order a monthly box of treats – saving 33%. So, if you order 6 packets a month, you only pay for 4 packets. New subscribers receive a snazzy free tin with their first order. For every packet of treats you pay for, we give the same volume to a canine rescue home. So, pay for 4 packets and we donate 4 packets on your behalf. You are under no obligation and can cancel at any time (please just give us 7 days’ notice). 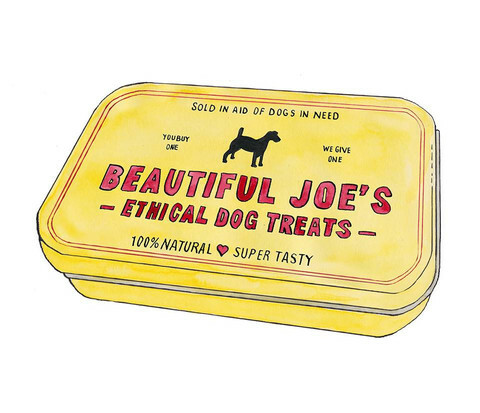 Beautiful Joe’s ‘Perfectly Behaved’ Liver Treats are hand-made from British (you can tell this because they always stand up when the National Anthem is played), free range, ox liver and dogs go crazy for them. Nothing is added – all we do is slowly dry the liver to lock in the flavour. 50g per packet.